The difference between a good product and a great one are its details: the microinteractions that make up the small moments inside and around features. How do you turn mute on? How do you know you have a new email message? How can you change a setting? All these little moments—which are typically not on any feature list and often ignored—can change a product from one that is tolerated to one that’s beloved. 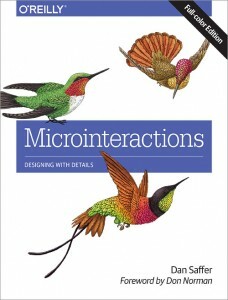 This book provides a new way of thinking about designing digital products: as a series of microinteractions that are essential to bringing personality and delight to applications and devices. The print edition can be ordered from Amazon.